Leeks are called the poor man’s asparagus in Europe. A member of the allium or onion family, they look like thick scallions but have a sweeter, milder flavor. Because this salad is somewhat more substantial than tossed greens, serve it before a savory tart, such as a quiche, or a simple egg omelet. Fill a 6-quart saucepan halfway with water. Bring to a boil and add the salt. 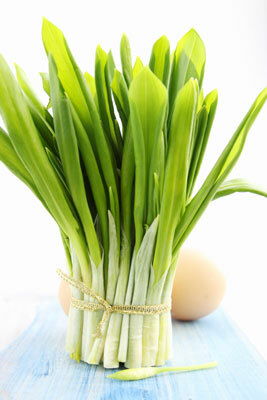 Tie the leeks into bunches with kitchen string. Place in the pot of boiling water, reduce the heat, and simmer, covered, for 10 minutes. Remove the cooked leeks with tongs and drain well in a colander. Remove the string and place the leeks on a serving platter. Remove the yolks from the hard-boiled eggs. Slightly mash the yolks with a fork and stir into the vinaigrette. Coarsely chop the egg whites and set aside. Drizzle the vinaigrette over the leeks and then sprinkle the parsley over them. Top with the chopped egg whites. Depending on whether you like your salad dressing with a pronounced vinegar bite, choose either Version I or II, with Version I being the stronger of the two. Place all the ingredients in a clean glass jar. Screw the lid on the jar and shake until the ingredients are well combined. Taste and add salt if needed.